The Plight of Rome in the Fifth Century AD argues that the fall of the western Roman Empire was rooted in a significant drop in war booty, agricultural productivity, and mineral resources. Merrony proposes that a dependency on the three economic components was established with the Principate, when a precedent was set for an unsustainable threshold on military spending. Drawing on literary and archaeological data, this volume establishes a correspondence between booty (in the form of slaves and precious metals) from foreign campaigns and public building programmes, and how this equilibrium was upset after the Empire reached its full expansion and began to contract in the third century. It is contended that this trend was exacerbated by the systematic loss of agricultural productivity (principally grain, but also livestock), as successive barbarian tribes were settled and wrested control from the imperial authorities in the fifth century. 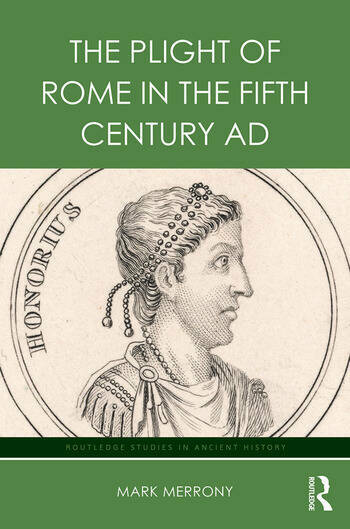 Merrony explores how Rome was weakened and divided, unable to pay its army, feed its people, or support the imperial bureaucracy – and how this contributed to its administrative collapse. III Crisis! What Crisis ? Mark Merrony is a Supernumerary Fellow at Wolfson College, University of Oxford, and a Fellow of the Society of Antiquaries of London (both in the UK). He specializes in Roman archaeology and history, and has undertaken fieldwork in Britain, France, and the Levant. Socio-economic aspects of Late Roman Mosaic Pavements in Phoenicia and Northern Palestine was published in 2013, and he has authored several peer-reviewed papers on the subject.